4th Quarter 2018 FUSF Raised to 20.1 Percent. Contribution Factor: Telecommunications companies must pay a percentage of their interstate end-user revenues to the Universal Service Fund. This percentage is called the contribution factor. The contribution factor changes four times a year (quarterly) and is increased or decreased depending on the needs of the Universal Service programs. 2nd Quarter 2018 FUSF lowered to 18.4 Percent. ALERT – The 2018 USAC Filing Window Closes March 22nd! 1st Quarter 2018 FUSF increases to 19.5 Percent. EM3 Networks is now an Accredited Business of the Better Business Bureau. Big night at the AT&T APEX Summit for EM3 Networks. We were humbled to win the Wireline Business Acceleration Award for 2017. 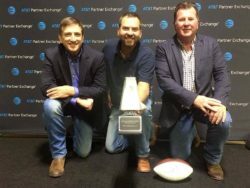 Thank you to Emmitt Smith, Brooks McCorkel, Randall Porter and the entire AT&T APEX team for this wonderful award and recognition! The service provider must have certified an FCC Form 473, Service Provider Annual Certification (SPAC) Form, for FY2016. The applicant must have certified an FCC Form 486, Receipt of Service Confirmation and Children’s Internet Protection Act Certification Form, featuring the FRN. New Drop-Down Options in EPC for Completing the FCC Form 470 – On Saturday, August 26, 2017, a new simplified set of drop-down options will be available to applicants completing the FCC Form 470 who are requesting bids for eligible services in EPC. If you have already filed an FCC Form 470 for FY2018, or plan to do so between now and August 26, 2017, you do not need to refile the FCC Form 470. FCC Forms 470 filed using both the current and simplified drop-down options in EPC will be accepted for FY2018, subject to program rules. Please review the August 22 Special Edition Schools and Libraries News Brief for additional information on these changes and guidelines to help utilize the drop-down menu options. On Saturday, August 26, 2017, a simplified set of drop-down options will be available to applicants completing FCC Form 470 to request bids for eligible services in the E-rate Productivity Center (EPC). The simplified drop-down options will apply to FCC Forms 470 filed for FY2018 on or after that date. If you have already filed an FCC Form 470 for FY2018, or plan to do so between now and August 26, 2017, you do not need to refile FCC Form 470. FCC Forms 470 filed using both the current and simplified drop-down options in EPC will be accepted for FY2018, subject to program rules. So that we can best assist our customers, the EM3 team attended the all day USAC Schools and Libraries (E-Rate) training last month in Dallas, Texas. This training was presented by the USAC E-Rate professionals and covered all areas of the program. The intent of the training was to ensure that those Service Providers who attended have all of the most recent updates and changes for the Fund Year so that we can best serve our Schools and Libraries customers. If you intend to file BEAR Forms for your FY2016 recurring services, request a PIN and certify your FCC Form 498 if you haven’t already done so. The invoice deadline for these services is October 30, 2017 (October 28 is a Saturday) if your FCC Form 486 Notification Letter is dated on or before June 30, 2017. Service providers no longer review and approve BEAR Forms, and BEAR payments go directly to applicants. This applies to BEAR Forms for all funding years. Applicants who want to request reimbursements directly from USAC by submitting an FCC Form 472, Billed Entity Applicant Reimbursement (BEAR) Form, must first certify an FCC Form 498, Service Provider and Billed Entity Identification Number and General Contact Information Form. USAC must review and approve each FCC Form 498 before you can receive a 498 ID. The 498 ID will then be featured on each BEAR Form you submit. Third Quarter FUSF drops to 17.1 Percent. The Federal Communications Commission released a Public Notice (DA 17-58) announcing that the proposed universal service contribution factor for the third quarter (July-September) of 2017 will be 0.171 or 17.1 percent. EM3 earns IOT certification. 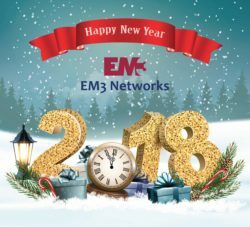 EM3 Networks has earned the 2017-2018 Professional Internet of Things Certification from AT&T APEX. Applicants can file an FCC Form 486 for FY2017. Applicants with full or partial rights in EPC for FCC Form 486 for their organization can now complete an FCC Form 486 for FY2017. Applicants with full rights can certify the form. E-Rate Funding Year 2017. USAC is scheduled to release Funding Year (FY) 2017 Wave 7 Funding Commitment Decision Letters (FCDLs) on July 14. This wave includes commitments for approved applications for all service types and at all discount levels. As of July 7, FY2017 commitments total over $276 million.